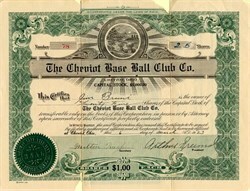 Beautiful certificate from the Cheviot Base Ball Club Co issued in 1923. This historic document was printed by Goes and has an ornate border around it with a vignette of a meadow. This item has the signatures of the Company's President and Secretary and is over 84 years old. There are some pieces missing on this certificate as can be seen on the scan. The Cheviot Baseball Club (Cheviot Patriots) has been a semi-pro baseball club in Cincinnati since 1912.